The Voluntary Sector is alive and well in and around our community. This page provides some key links to important organisations and groups that have a more ‘strategic’ place in the local community network. For specific local group links, please explore Local Groups ► Group Links from the left-hand menu. For a broad, up-to-date and comprehensive coverage of news across Nottinghamshire’s ‘third sector’, see the weekly Nottinghamshire Together newsletter hosted on BCVS’s website Latest News section here..
Local organisations are always looking for volunteers - just an hour or two a week can make all the difference! Retford’s Cancer Research UK shop is just one example - click on the poster for a bigger view. Clarborough Village Hall also needs volunteers to help maintain their services - just a small amount of time on a regular basis would make a huge difference to the services our hall could provide. 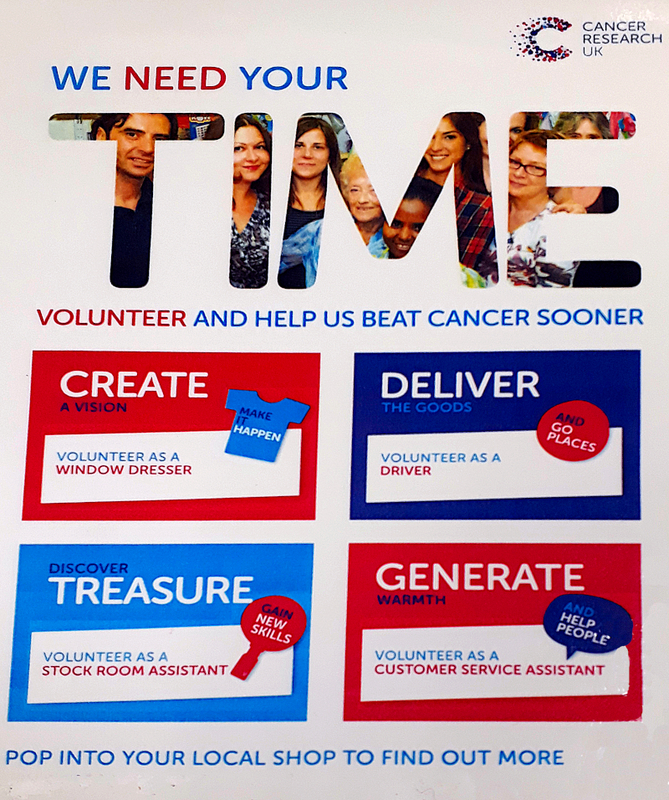 If you would like to get involved as a volunteer, please contact your chosen groups directly. Alternatively, if you are looking beyond our local community for volunteering opportunities, we post a few opportunities on our linked Volunteer Opportunities page - or contact your chosen organisation directly - they will be delighted to talk to you.